In addition to Service Bulletin 18-02-02 for the stabilator (recently completed), Van’s also released Service Bulletin 18-02-03 the very next day calling for an inspection of the anti-servo tabs that mount onto the stabilator. Service Bulletin 18-02-03 addresses potential cracking on the forward edge of anti-servo skins adjacent to the HS-1220-R & L control horns and between the spar and the control horn. This is another service bulletin that was introduced due to a very small number of RV-12’s developing cracks adjacent to the HS-1220 control horns. Fortunately, the DOG Aviation RV-12 did not have any cracks on the anti-servo tab skins … but decided to complete Service Bulletin 18-02-03 anyway, so there won’t be the need to mess with it later after the airplane is painted should a crack develop. My finger is pointing to the area on the anti-servo tab skin that needs to be inspected for cracks. 1. - No cracks are discovered (that's good) fly on and reinspect during the next annual condition inspection. 2. - No cracks are discovered ... however, the builder/owner decides to go ahead and perform the steps in Service Bulletin 18-02-03 and just replace the inboard ribs to prevent cracks from forming. 3. - Cracks are found - This will involve not only replacing the inboard ribs on the anti-servo tabs and but also installing doublers to cover the cracks and strengthen the weak area. Builders/ owners take note …. 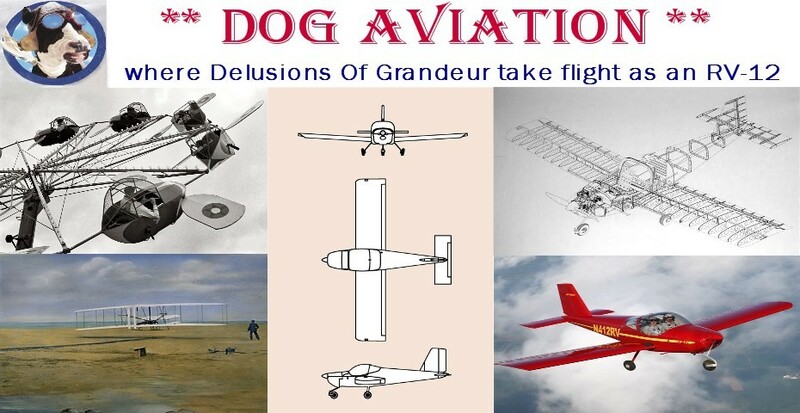 the DOG Aviation RV-12 was constructed using flush rivets, so you will see dimpled holes and flush rivets on the anti-servo tab’s skins and ribs in most of the photos in this post. Those of you using the photos found here as a general reference, please disregard the skin and rib dimples and the use of flush rivets attaching the skins to the ribs … your anti-servo tab’s will not be dimpled so you will be using the standard Van’s LP4-3 pop rivets that come with the service bulletin to secure the skins to the new ribs. Performing the work on the service bulletin (via either path 2 or 3) involves removal of the HS-1222 inboard rib on each anti-servo tab (the rib that the HS-1220 control horns are riveted onto) and replacement with a new HS-1230 rib included with the service bulletin parts. In addition to the two new HS-1230 ribs, Service Bulletin 18-02-03 also contains additional parts used to reinforce the anti-servo tabs if cracks are discovered … those parts are HS-1226A & HS-1226B (upper and lower doublers which come as one piece and require separating) and the HS-1228 spacer. Parts included with Service Bulletin 18-02-03 consist of two HS-1230 ribs, HS-1226A upper doubler (on the left with the slot), HS-1226B lower doubler and the HS-1228 spacer. Because the DOG Aviation RV-12 had no cracking on either anti-servo tab, the doublers will not be used …. however, the drawing and photo below shows where the parts will end up being installed if cracks are discovered. Figure 7 from Service Bulletin 18-02-03 showing the placement of parts if cracks are discovered on the anti-servo tab skins. This is how the parts will be installed should cracking be discovered on the anti-servo tab’s skins. The spacer bar will be installed between the anti-servo tab and the HS-1226B lower doubler. So what does replacing the inboard ribs of each anti-servo tab accomplish? It makes the assembly much stronger and will greatly reduce skin flexing adjacent to where the control horn attaches to the anti-servo tab’s inboard ribs. By looking at the close-up below, one can clearly see that the original HS-1222 inboard rib ends just forward of the control horn leaving an open gap between it and the spar that allows the thin skin to flex between the HS-1222 rib and the spar. The HS-1230 replacement rib now goes all the way forward and has tabs which will be riveted to the anti-servo tab’s spar … which can be seen in the photo below on the far right in the photo below. Side view close-up of the inboard portion of the left anti-servo tab. As one can clearly see, the HS-1222 rib that the control horn is riveted onto ends just forward of control horn leaving a large gap between it and the anti-servo tab’s spar on the far right. The replacement HS-1230 rib sitting adjacent to the inboard side of the anti-servo tab … one can see it is longer and will extend further forward to the anti-servo tab’s spar. Also noteworthy, there are now two additional flanges on the HS-1230 rib that will be riveted onto the anti-servo tab’s spar. The new flange my finger is pointing towards to will be riveted to the anti-servo tab’s spar at the rivet location my other finger is pointing towards. Extending the rib forward to tie into the spar should eliminate the skin flexing. Following the steps in the service bulletin, if no cracking is found, the builder/owner is instructed to skip to Step 4 which is the removal of eight rivets holding the HS-1222 inboard rib in place and two spar rivets. Step 5 instructs the builder/owner to drill out the rivets holding the HS-1220 control horn onto the HS-1222 rib. I would strongly suggest reversing the order of Steps 4 & 5 because the offset of the HS-1220 control horn makes it very difficult to safely pound out the mandrels of the rivets adjacent to the control horn prior to drilling. For me it was much easier to carefully remove the rivets securing the HS-1220 control horns to the HS-1222 inboard rib first. Once the control horn was removed pounding out the mandrels in the rivets adjacent to the control horn was a piece of cake. To remove the rivets from the HS-1220 control horns the center of each rivet was marked and then center punched followed by very carefully drilling a tiny lead hole. This was followed by using a #40 drill bit with tape on it to denote the depth I wanted to drill which was just shy of getting all the way through the rivet head. After drilling most of the way through the head a nail set was used to carefully pop the head of the rivet away from the HS-1220 control horn. The HS-1220 control will be reused and riveted onto the new HS-1230 rib … so once the HS-1220 control horns are removed, mark them and set them aside. After a tiny lead hole was drilled into the center of each rivet, a #40 drill bit was covered with masking tape to denote the depth to drill … which was not quite all the way through the head of the rivet. My finger is pointing to the right anti-servo tab’s HS-1220-R control horn removed from the anti-servo tab assembly. After removing both control horns from the anti-servo tabs mark them and set the control horns aside … they will be reused. With the control horns removed, pounding out the rivet mandrels is now an easy task. After the mandrels were removed from the pop rivets, the rivets were removed using a #30 drill bit with a metal collar on it that only allowed the drill bit to go down just deep enough to almost go completely through the head of the rivets … but not quite. Then a nail set was used to remove the head of the rivets. After all the rivets are removed from the HS-1222 ribs, the ribs are removed … and discarded. Carefully pounding out the mandrel from one of the rivets that would have been very difficult to access if the control horn were not removed first. The original HS-1222 rib on the right will be replaced with the new HS-1230 rib on the left. Here one can see a close up of the old HS-1222 rib on the right and the design of the new HS-1230 rib on the left. The new HS-1230 rib is longer and also has two flanges that will be riveted onto the anti-servo tab’s spar. After removing the old HS-1222 ribs, the new HS-1230 ribs are inserted in each anti-servo tab and secured with Clecos. There are four rivet holes that need to be match drilled. Two holes on the aft end of the HS-1230 ribs (one on each side of the anti-servo tab). The remaining two holes will be drilled through the anti-servo tab’s spar into the flanges on the new HS-1230 ribs. Using a #30 drill bit to match drill the anti-servo tab’s spar to the flange on the new HS-1230 rib. After the four holes have been drilled, the HS-1230 rib is removed from the anti-servo tab and the freshly drilled holes were deburred. Preparations for the final assembly begin by securing the HS-1220 control horns onto the new HS-1230 ribs with Clecos … then riveting each HS-1220 control horn onto the new HS-1230 ribs using five AN426AD3-3.5 rivets. The right HS-1220 control horn secured on the new HS-1230 rib with Clecos and ready for riveting. Riveting a HS-1220 control horn onto one of the new HS-1230 ribs using AD426AD3-3.5 rivets. Both HS-1220-L&R control horns riveted onto the new HS-1230 ribs and ready for final riveting onto the anti-servo tabs. Here again, disregard the dimples in the ribs ... they are unique to the DOG Aviation RV-12. Final assembly is straight forward … insert each HS-1230 rib/ HS-1220 control horn assembly under the anti-servo tab’s skins and secure with Clecos. Eight rivets are used to rivet the skins to the ribs and two more rivets are used to rivet the spar to the flanges on the new HS-1230 ribs. The offset on the HS-1220 control horn does create a small access issue for the two rivets adjacent to it. The easiest way to get around the issue is to place a slight bend on the rivet’s mandrel with a pair of pliers and then use a small piece of AEX wedge slid over the rivet. Doing this will place the hand rivet puller at a small enough of an angle to clear the HS-1220 control horn and still allow the rivet to be kept square to the skin while the rivet is set. Long time readers of the DOG Aviation Blog have seen this method used before when setting rivets in tight spots. Riveting the anti-servo tab’s skin to the new HS-1230 rib and HS-1220 control horn assembly using a pneumatic rivet puller. The pneumatic rivet puller can be used on all the rivets except the two adjacent to the HS-1220 control horn. In this photo, one can see the PRG-26A close quarters hand rivet puller is outfitted with an AEX wedge between the rivet and the nose of the rivet puller. The use of a piece of AEX wedge as shown in this photo is a great way to access tight spots. The mandrel of the rivet is bent a little with pliers and the AEX wedge allows the rivet puller to be placed at a slight angle while pulling the rivet. Completed Service Bulletin 18-02-03 (rib replacement only) … both anti-servo tabs now have the new HS-1230 ribs installed and are now ready to be placed back in service. In the grand scheme of things, Service Bulletin 18-02-03 is not very time consuming and quite easy to accomplish. The only task that one really needs to perform as careful as possible is drilling out the HS-1220 control horn rivets … because one does not want the rivet holes to become elongated. As mentioned above, carefully mark and center punch the rivets, then drill a tiny lead hole #60 or smaller to minimize drill bit drift when drilling with the #40 drill bit.